You know it's important to document your family in pictures, but sometimes it's difficult to know where to start. I understand how awkward it can feel to get your photo taken. I’ll capture your family in a simple, relaxed and candid way. A photo shoot can be fun -- and with a little bit of planning (and a photographer that can put you at ease), you can create memories that are as beautiful as they were fun to make! Here are my 5 tips for relaxed, carefree and FUN family photography sessions! I am a firm believer that kids are just happier when they're outside. And happy kids = better photographs. Studio environments are convenient, but there's a freedom in letting your kids have a bit of breathing room. Plus nothing beats the beauty of green space. For that reason, I photograph ALL of my family sessions in the great outdoors. #2 Go for style AND comfort! Although dressing up for your photos is a good thing, I would caution you from OVER dressing. For family photographs, I think it's important to FEEL GOOD in what you're wearing, but also feel like you have freedom of movement! You don't want to feel hemmed in and locked down by your clothes. We'll be walking through the grass, sitting, standing and playing -- so it's important to strike a balance between comfort and style. Clothing is so personal, so this will mean many different things to different people, and that's great. Often times for women this can translate into more polished hair and makeup, but still wearing something you love, that's not restrictive. If you'd like to check out my style guide, you can do so, here. Ultimately you want to look like yourself in these images, so resist the urge to purchase an outfit that doesn't look like something you'd typically wear. Stay consistent with your own style, but add a little extra with accessories or colour! Have a look at the image, below: mom looks amazing in a simple tank with jeans and she's able to run around and enjoy her kids, too! My toddlers three favourite things are: afternoon naps, snacks and playing with her big brother. If we can get two out of the three right - we're in for a great day. For your kids it may be some quiet time, or a certain daily routine that puts your child at ease. With our busy lives, it's more important than ever before that we ALL get a bit of self care in our day (Mom + Dad, I'm talking to you!!). I recommend that one or two days before your session, try and line things up the best you can to ensure you can get everyone's needs met on photo day, and that will create an excellent groundwork for an evening of fun and photographs. You deserve it! Unlike many photographers, I don't encourage parents to promise their children a treat or bribe if they behave during the session. Instead I've found better results if you "frame" the photo session as the treat! A few days leading up to the session tell your kids that you'll be going out together as a family and that they'll get your full attention. Explain you're going to go for a walk, playing together and talking about all your favourite things. Let them know that while you're spending time together that I'll be there taking some photos, and joining in on the fun, too. When I meet your children I'll introduce myself, and I won't take out my camera right away. I'll explain what I'm doing, introduce myself and we'll build up a bit of trust before I start taking photos. I am very flexible with children during my photo sessions and I believe in using a combination of posing and allowing candid moments to unfold. If you leave it to me to direct your children, I'll ask for help if necessary. At the end of the day, the more fun we have, the better and more beautiful your photographs turn out! This is perhaps my favourite tip. Shift your thinking from "I am getting family photos taken" to "I am going to relax, unplug and enjoy spending time with my family". Not only does it take the pressure off of you to worry about the photo part (because...hey...that's MY job!!) But it's also a great reminder that in our busy lives we don't always get to spend a lot of quality time with our family. When the opportunity comes up, it's a wonderful gift for you and your children to be present, and enjoy the beautiful family that YOU created. Soak it all in and savour the goodness in your life, right here and now. At the end of the day, that's what it's all about! 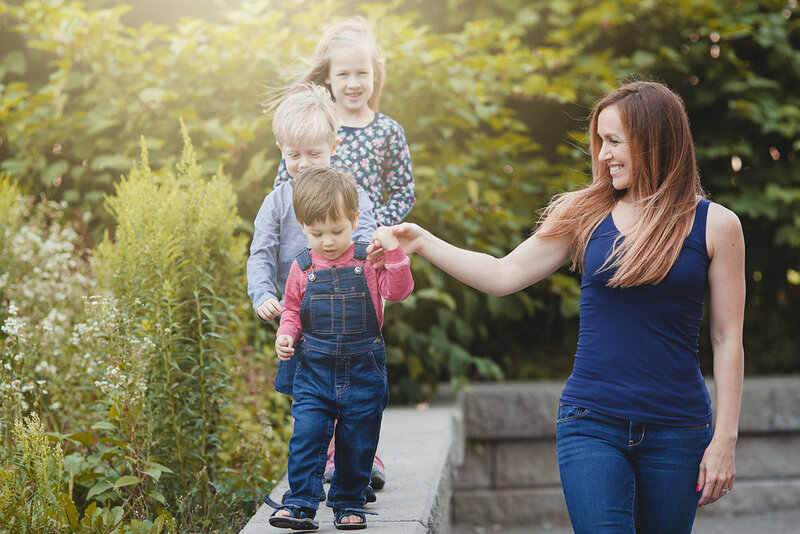 If you'd like to learn more about my outdoor family sessions, contact my studio by clicking the link below or join sign-up for first dibs on my spring/summer session calendar!